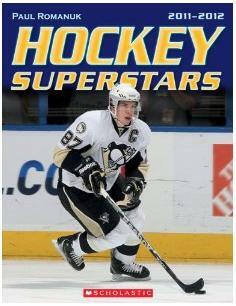 What would a hockey book season be without Paul Romanuk's Hockey Superstars 2011-2012 . For 25 years no Romanuk has been churning out the popular Superstars series for Scholastic. Full of colour photography and interesting stories and always priced very reasonably, this is a great book for the young hockey fan on your Christmas shopping list. NHL superstars are profiled with glossy full-page, full-colour photos, bios, stats, and interview quotes. Included in this book are Sidney Crosby, Alexander Ovechkin, Henrik Zetterberg, Steve Stamkos, Nicklas Lidstrom, Michael Cammalleri, and more.